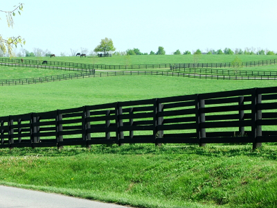 Miles of ebony fencing, reminiscent of perfectly spaced stitches of an heirloom quilt, stretch over lush green fields and paddocks along Winchester Road in Bourbon County, KY. The 10-mile stretch that starts at Caviart Farms and ends in downtown Paris, KY has been nicknamed "Avenue of Champions" because of the seemingly endless list of top racehorses and sires that have been born, raised or stood at stud here. 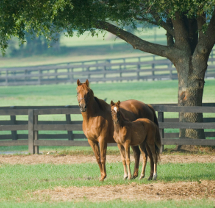 Claiborne Farm, just a few miles down the road from Caviart Farms, has been noted as one of the most influential breeding operations in the world. 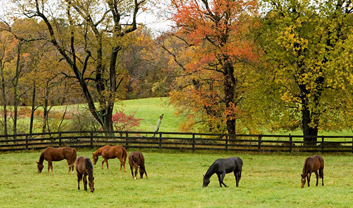 The scenic 3,000 acre farm, visited twice by Queen Elizabeth, has been in the hands of Thoroughbred racing's famed Hancock family since 1915. It has produced two Triple Crown winners, and among its star-studded legacy are such awe-inspiring names as -- Bold Ruler, Nijinsky II, Round Table, Buckpasser, Princequillo, Nasrullah and Mr. Prospector. Also, Danzig, Sea Biscuit, Monarchos, Pulpit, Unbridled, Forty Niner and Whirlaway were born and/or raised there. In 1973 the farm syndicated Secretariat for a then record $6 million. Secretariat went on to win the Triple Crown later that year, and later took his place on the Avenue of Champions as a stud at Claiborne until his death in 1992. Immediately next door to Caviart Farms is Stone Farm, owned by Arthur Hancock, brother of Claiborne Farm's Seth Hancock. This 2,000 acre breeding operation lays claim to its own illustrious list of superstars - including millionaires Sunday Silence, Gato Del Sol, Risen Star, Fusaichi Pegasus, Skywalker and Menifee. Caviart Farms' land produced its own champion - Spend A Buck. This 1985 Kentucky Derby winner was raised on the rich, Maury-soiled fields of the farm. After winning the Derby in wire-to-wire fashion and in the third fastest time (2:00 1/5), Spend A Buck's owner opted to skip the final two jewels of the Triple Crown in favor of racing for a $2 million bonus which he collected when Spend A Buck captured the Jersey Derby. Spend A Buck was named 1985 Horse of the Year.